‘The Well’ is a 3 screen video installation. 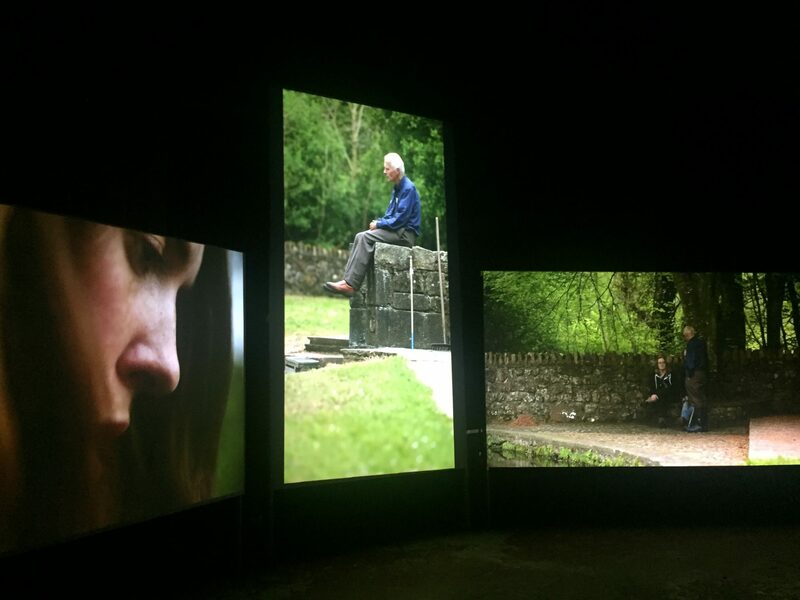 In 2016 Mc Guinness devised a live, public, performance intervention at St Patricks Well inspired by the story of Bridget Cleary a suspected witch who was burned alive by her husband in 1897. Mc Guinness returned to the well a year later to work with David Flannery the custodian and keeper of the well whose daily ritual of maintaining and protecting the well is observed in the film. This quotidian existence is juxtaposes with that of the female dancer whose restless movement looks to harness the energy within the well. Neither is witness to the other but both use the well as a host site, a place to experience deep belonging and connectedness. As with previous works at ancient pagan sites, the artist draws on the universal symbol of the well as a place of ritual, mystic charge and an ancient symbol of female fertility and power. Collaborating with dancer Liv O’ Donoghue and the guardian of the well David Flannery, the artist combines real and fictive performances in a 3 screen video installation with a minimal sound design by Ellen King. Duration: 13 mins, 30 seconds.